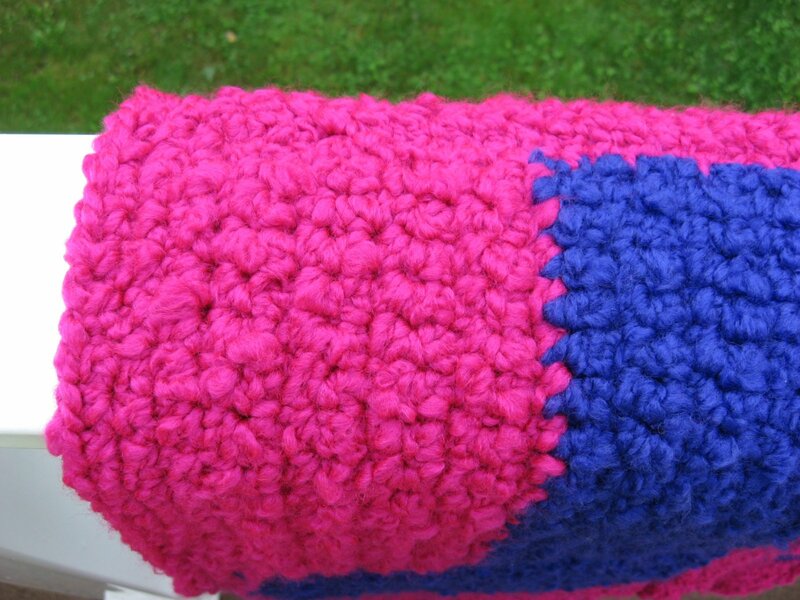 Hooked on Needles: Pink and Purple Crocheted Afghan ~ Complete! Pink and Purple Crocheted Afghan ~ Complete! Fall is here so it's time to pull out the cozy afghans and light a fire in the fireplace. The Fall into Fall Giveaway is in full swing with lots of great prizes being offered by well over 100 different sites. You can find mine by clicking HERE. Make sure you follow the rules and include an email address or your entry won't count! 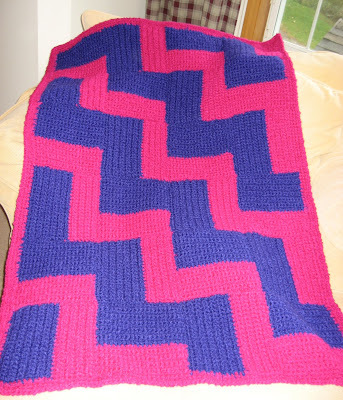 I've been working on a very cozy afghan for a few weeks now, and a few days ago I finished it. I've been waiting for a sunny day to take pictures of it outside, but I finally gave up and settled for this morning when it wasn't pouring rain for a few minutes! That will have to do for now! I think the outdoor pictures came out pretty well and I know for a fact that this afghan will keep the chill off of anyone on a cold fall day! 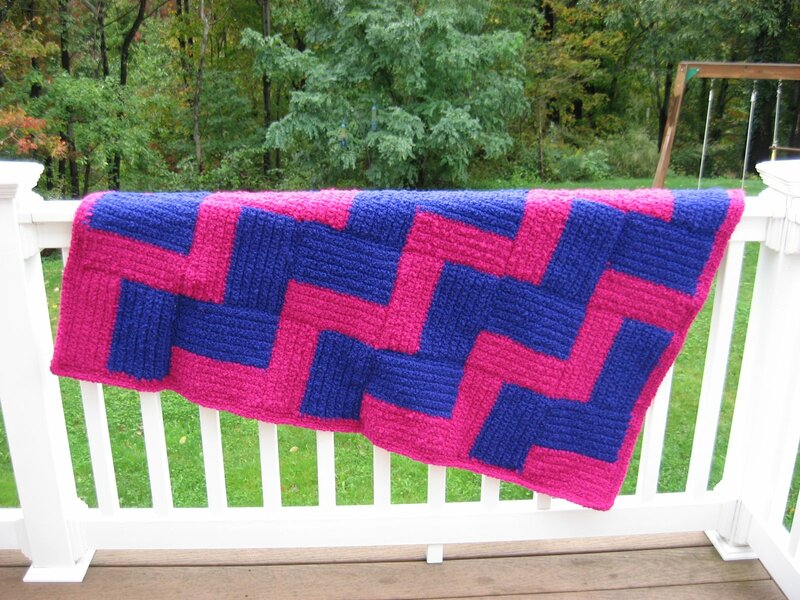 This is the afghan I was working on HERE during our last election. It's made with Patons Melody Quick and Cozy yarn using the Autumn Afternoon Afghan pattern from the Lion Brand free pattern collection. Don't you just love the bright colors? Well, ok, but don't you think some little girly girl will just love these bright colors? You can see in the detail here that the stitches are all very close together and the yarn is very thick and cozy. 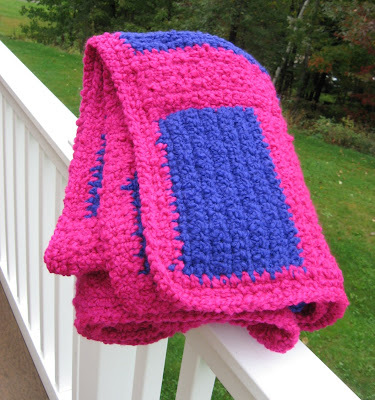 This would make a wonderful blanket for any little girl who likes to be cozy while playing with her dolls or reading a good book. Measuring 35 by 53 inches, this afghan would also be great for using on a toddler or twin size bed to keep those little toes warm at night. This pattern was very easy to make and I would recommend it for any beginner crocheter who would like to make a multi-colored afghan using blocks. 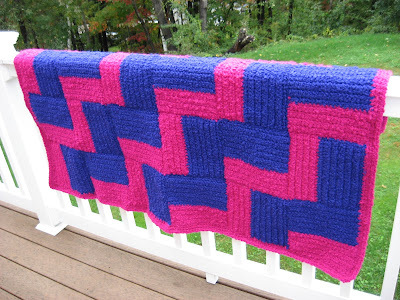 The block pattern is all single crochet and because it is worked in individual blocks, this would also make a great take-along project. I'll be putting this afghan into my Etsy shop later today, along with a fall table runner exactly like the one I am giving away in the Fall into Fall Giveaway. Coming up soon, I'll be showing you my progress on the Bernat Mystery Afghan Crochet-Along. Clue #3 was posted yesterday and requires 8 blocks in the light green Fern color. I made one last night and just love how it looks. No holes for toes to poke through! What a happy snuggily for winter. This turned out so pretty - love the colors. Oh is that beautiful. I love the bright fun colors! Absolutely gorgeous! It looks like a quilt! And the yarn you used looks scrumptious! Looks very comfy and cozy. Love the bright colors to offset dreary days ahead. It looks really soft and cozy. Great job.